This administrative feature can be used to request leaves for other users for back dates & future dates, apply or reject leaves, view leaves and change/ edit leaves of other users. This option is available ONLY for “Manager” & “Admin” type users. Step 1: Click on -> Select -> Click on on main toolbar to open the below window. Step 2: Set user name by clicking on the “User Name” text field and select the user from “Select User” window. Click on button. 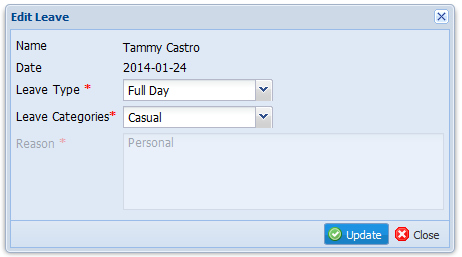 Step 3: Set [From] and [To] (optional) dates by clicking calendar icon at the end of the fields. [To] date field is use when applying for more than one day. Step 6: Write the reason of the leave in the [Reason] field. Step 7: Click on to add leaves for the selected user OR click on button to close the window. Step 2: Click on icon to select the view option. 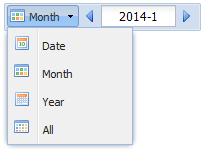 Select option as either “Date”/ “Month”/ “Year” or “All” to change the viewing option by month, by year or by all. Default is by month. For “Year” view, there are two navigation keys to help the user. Left arrow change the view to leaves of previous years, and right arrow change the view to leaves of next year’s according to the year displayed between navigation arrow keys. For “Date” view , select [Date] from view options. Click down arrow to select a date from calendar to see leave details of that date. Step 3: Paging bar will help to limit the number of leaves to be shown. Use down arrow to change the limitations. Step 1: Click on -> Select -> Click on icon in the action column you wished to change/ edit. Step 2: Do the necessary modifications in the “Edit Leave” screen. Step 3: Click on button to save the changes OR click on button to close the window. Through this option managers can apply or reject leaves of their subordinates. Step 1: Click on -> Select -> Click on icon in the action column. Step 2: Select the “Approved” to approve the leave or select “Rejected” to reject the leave. 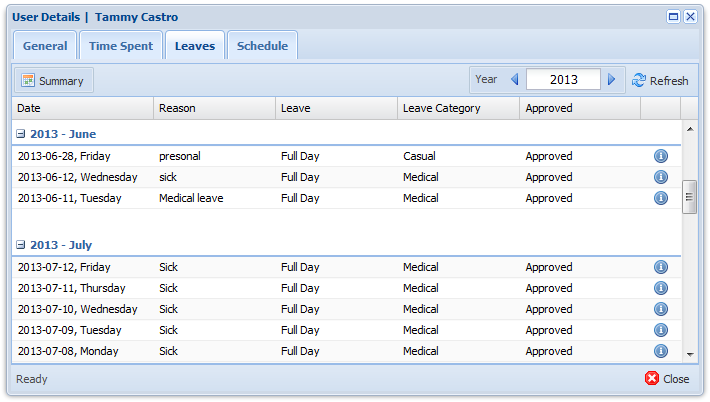 Once an employee requests a leave through “My Leaves” option, the leave will be on “Pending” state. Managers/ Admin can approve their own leaves as well using this option. Step 1: Click on -> Select -> Click on “Remove” icon in the action column you wished to delete. Step 2: Click on “Yes” button in the “Remove confirmation” pop-up box to delete the selected leave. Step 2: Click on “More Information” icon in the action column to open “Leave | More Information” window. Step 1: Click on tab -> Click on “User Details” icon in the Job Information Status Box of selected user you need to view leave summary. Step 3: Click on “View Details” in-front of each leave to view the more information; such as leave date, reason, leave type, approved or not, applied date, approved person, requested person and leave category of leaves.